The Google Pixelbook is Google’s flagship Chromebook showing the world just how great a Chromebook can be. Replacing the Chromebook Pixel, the Pixelbook fixes any of the doubts about the Chromebooks future. What makes the Pixelbook so special is how Google has managed to produce a laptop that can compete with any laptop on the market. It’s a Chromebook but it can compete if not surpass the likes of the Apple MacBook Pro. The Google Pixelbook is without question the best performing Chromebook. However, it goes one step further, as the Pixelbook not only outperforms any Chromebook out there right now, it also outperforms the Apple MacBook Pro and Microsoft Surface. So the question should not be if you want the best Chromebook to go for the Pixelbook. It should be if you want the best laptop out there right now, go for the Google Pixelbook. The design of the Pixelbook is simply beautiful. The Pixelbook with its brushed aluminium chassis and super thin dimensions makes it one of the smartest looking laptops on the market right now. No longer does it mean settling for second best in the looks department if choosing a Chromebook over an Apple or Windows-based laptop. The Google Pixelbook looks ultra cool. From the aluminium top to the rubberised bottom, the Pixelbook not only looks great but is practical to use. Having a rubberised bottom makes using the Pixelbook on your lap a comfortable option without having to worry about the laptop slipping off your lap onto the floor. The rubberised theme continues with the palm rest, which makes it comfortable to rest your palms when typing on your Google Pixelbook. Whilst we’re talking about typing, the keyboard on the Pixelbook is to die for. It’s without question, the best keyboard available on any laptop right now. Typing on the Pixelbook is an absolute pleasure. The keys are well spaced and the keys travel down when typing, which has become a rarity in ultra-thin laptops. This cannot be underestimated if you need a laptop to type with. You will never want to use another laptop for typing once you’ve used the keyboard on offer from the Pixelbook. Google Pixelbook can be used as a tablet. Each key press provides a satisfying click, so you can ‘performance type’ without any of the problems you get with most keyboards on offer from the ultra-thin laptop market. Also, if you do type a lot you’ll be happy to know the Pixelbook comes with a backlit keyboard, so you can type day or night. The dimensions of the Pixelbook at 11.4 by 8.7 inches makes it an obvious choice for people who need a laptop on the move. The thickness of the Pixelbook at just 0.4 inches makes it one of the slimmest laptops on the market. The slim dimensions also make the Pixelbook look so great. Talking about it being a perfect laptop for people on the move, it weighs in at just 1.1kg, which is ultra light for a laptop offering such great performance. When it comes to performance it’s no surprise the Google Pixelbook excels. The Pixelbook is without question the best performing Chromebook available. Whether you task it with number crunching on a spreadsheet or photo editing the Pixelbook will handle it with ease. 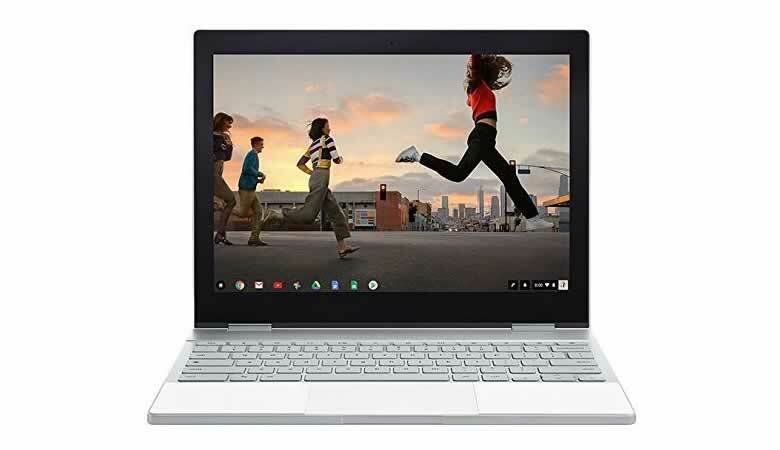 However, forget about performing against other Chromebooks, as the Pixelbook even outperforms the Apple MacBook Pro and Microsoft Surface. Who would have thought that would have been mentioned in a review about a Chromebook a few years ago. It’s an amazing achievement for Google and excellent news for Chromebook fans. This is not only thanks to the Intel Core i5 dual-core processor with a 4MB cache and a processor speed capable of 3.3Ghz. It’s thanks to the super light operating system ‘Chrome OS’, which the Chromebook uses. This together with excellent processing power means the Pixelbook easily outperforms the Apple MacBook Pro or Windows Surface. The Pixelbook does not disappoint when it comes to battery life. This is something where Chromebooks excel, and the Pixelbook does not let us down here. It offers over 10 hours of usage from a single charge. However, this depends on what you’re doing, but even with extreme usage during the day, it should last you about 7 to 8 hours. This is much more than you would get from a Mac or Microsoft laptop. The 12.3-inch display offers something to rival a Microsoft Surface or Apple MacBook Pro and this is thanks to the 235 pixels per inch. The resolution on offer of 2,400 x 1,600 pixels means you get one super crisp image. The display gives an amazing brightness, which makes watching movies or looking at photos a delightful task. The colour reproduction is amazing and is something that needs to be seen to be believed. 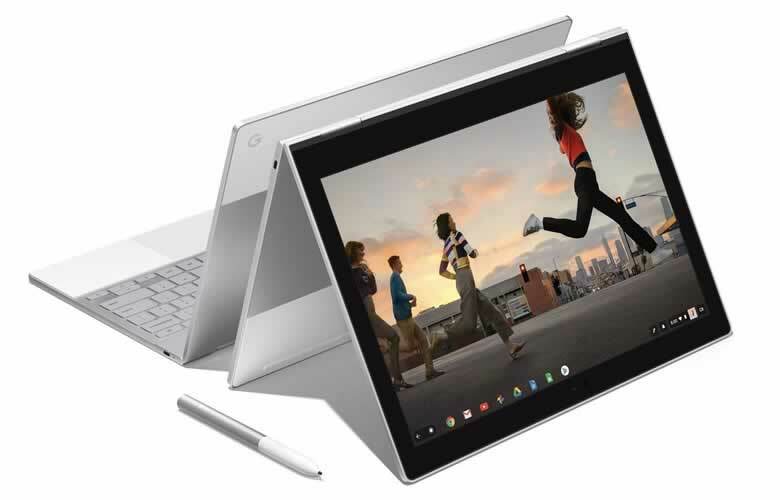 The Pixelbook is a convertible Chromebook, which means it also works as a tablet. It also has the option to use the Pixelbook pen, which provides amazing accuracy when drawing on the Pixelbook. The Pixelbook pen, however, is an optional extra, so you will have to fork out some extra money if you’re wanting to take advantage of this. One of the great functions of the Pixelbook pen is the button on the side. Hold this button down while drawing around an image, and the Google Assistant searches the internet to find out what the object is. It then comes back with a description for the object. This is a great feature and is fun to use. The sound quality of the Pixelbook is not amazing. This definitely is where the Pixelbook fails. 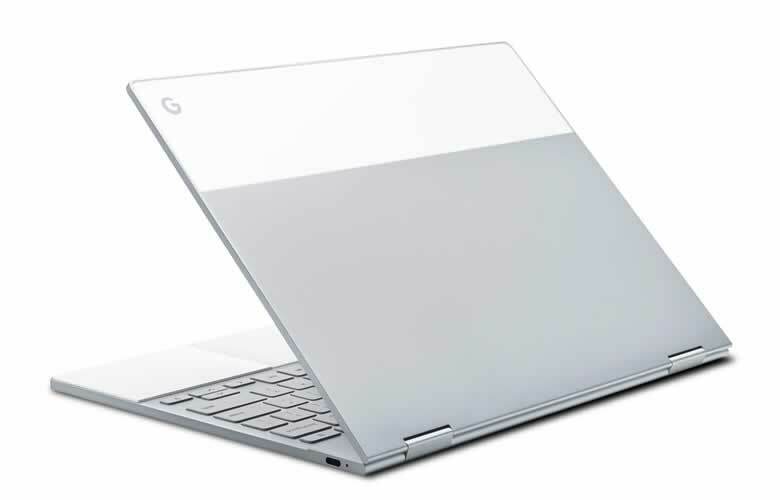 However, that being said, no laptop on the market offering such slim dimensions of the Pixelbook offer anything better. It’s sensible to expect, until technology gets better, to not expect too much in the way of sound quality when working with a device as thin as the Pixelbook. If you want to listen to music, then it’s a better option to plug in a decent pair of headphones using the headphone jack available. One of the biggest moves made by Google over the last couple of years was to make Chromebooks compatible with Android Apps. This greatly increased the flexibility of working with a Chromebook. However, no Chromebook to date has provided Android Apps in a seamless way. The Pixelbook has changed all this and shows the world what the Chromebook is capable of. Working with Android Apps using your Google Pixelbook is an absolute pleasure. The Google Pixelbook currently comes in three different models. The entry level comes with an i5 processor, 8GB of RAM and 128GB Solid State storage. The mid-range comes with the same processor and RAM, but with 256GB of storage. While the high-end model gives extra power with an Intel i7 processor, 16GB of RAM and 512GB of storage space. It also looks as if the price of the Google Pixelbook is coming down in America according to this article from the Forbes website. Dimensions: 11.4 x 8.7 x 0.4 inches. 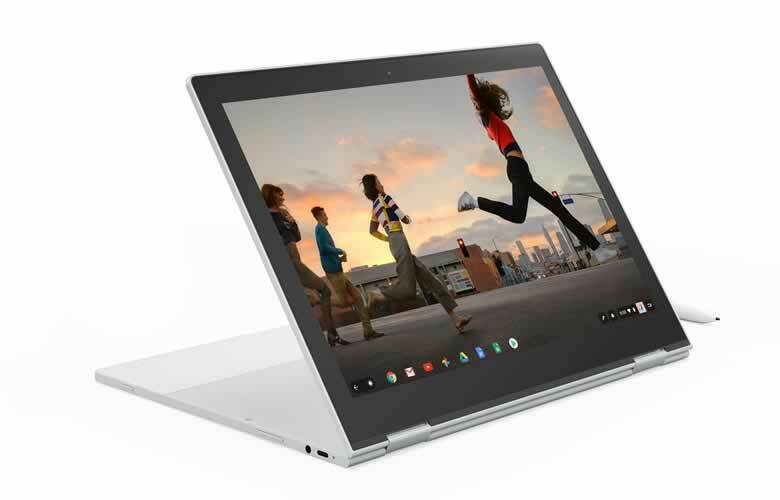 If you not only want a top of the range Chromebook but a laptop that can compete against the Apple MacBook Pro then this is the Chromebook for you. It not only provides excellent performance it’s also beautiful to look at. If you want to get your hands on the Chromebook that has shown the world just how good the Chromebook can be. Then this is the Chromebook for you.